Anyone who had an internet connection in 2015 probably remembers checking out agar.io, the unassuming browser game that became an overnight hit thanks to its simplistic yet incredibly addictive gameplay. Playing as a tiny little cell, you move your mouse around the screen to pick up tiny dots to increase your size, almost like a top-down 2D Katamari Damacy. The catch is that there are numerous other players doing the same thing all over the map, and any cell bigger than you can gobble you up to increase their own size. Like any popular game, this led to numerous knockoffs such as diep.io (agar.io but with a tank), pacman.io (agar.io but with Pac-Man), and the most popular of the copycats, slither.io, which is essentially agar.io mixed with the classic game of Snake. You eat dots to get longer and try to make opponents accidentally run into your increasingly long body to turn them into dots which you can eat to grow even longer, and so on and so forth. You’d think the story would end there, but slither.io itself is so popular that it’s managed to get a knockoff of its own, which brings us to Caterpillar Royale. While I’m not a fan of developers slapping a price tag onto free browser games and putting them up for sale on consoles, slither.io is fun enough that a version on Switch might actually be an entertaining prospect. 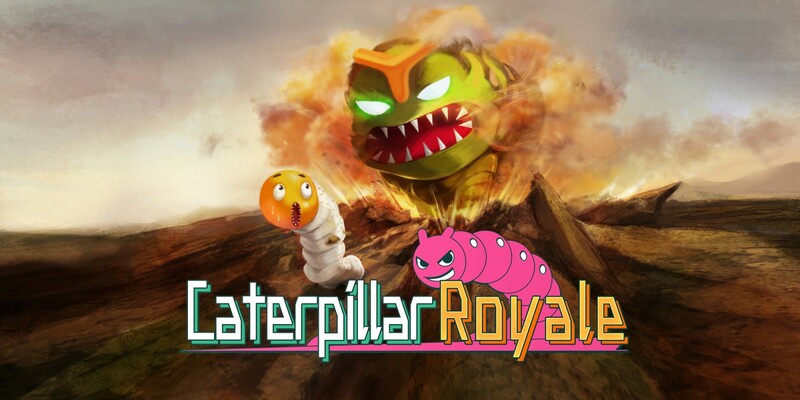 Unfortunately, Caterpillar Royale systematically removes everything that made slither.io fun and replaces it with boring and shallow mechanics that will entertain you for all of 15 minutes before you wish you were playing its far more entertaining inspiration. The game consists of three main modes. First up is Mission mode, which offers six levels of action-packed squirming (or at least as action-packed as a game about caterpillars can get) as you race to defeat a certain number enemies, collect a certain number of diamonds, or grow to a certain size. In classic slither.io fashion, there are lots of little pellets scattered about the large maps that you can eat to get larger, and eating these will increase your size while also slightly decreasing your overall speed. Since you can only be killed by hitting another caterpillar with your head, this creates a bit of a balance. Larger caterpillars have more mass to defend and attack with, but smaller caterpillars are faster and can potentially get the jump on the big guys. There’s just one thing missing – the other players. slither.io is a massive multiplayer online game, but Caterpillar Royale is strictly offline, which means the many other caterpillars you see are all AI… who can read your inputs… in a game all about faking out your opponents. I feel like I don’t even really need to go on any further, as this single change destroys the fundamental concept of the game. It’s simply not fun to play against cheating caterpillars that only die to blind luck or some incredible maneuvering on your part, and it’s made even worse by an awful new respawn feature. Upon dying, your character will appear somewhere else on the map and slowly move forward for a few seconds while staying invulnerable for a few seconds. Sounds fine, right? Well, you can’t control your caterpillar while this is happening. Did you happen to respawn near a caterpillar’s body? Whoops, looks like you’re instantly dead as soon as the invincibility wears off! The mission types don’t help matters. I think I’ve already demonstrated why killing enemies isn’t fun, collecting randomly placed diamonds on a huge map as a slow-moving caterpillar certainly isn’t fun, and growing to a designated size isn’t fun because the round always ends just as things start getting good. The fun of slither.io is becoming massive and dominating anyone that dares get in your path while simultaneously staying vigilant against the very real threat of instant death at the hands of a smaller yet smarter snake. Here, there’s no chance for any major size differences to occur, so instead of duking it out with others you just kill time meandering around while eating and grabbing a power-up or two until you’ve hit the meager size cap. That reminds me – I guess I should mention the power-ups, a terrible mechanic that makes a bad game even worse. There are three types of power-ups to find: one that makes you invincible against all attack for ten seconds, one that increases your speed for ten seconds, and one that simply increases your length by a decent amount. The growth item takes effect immediately, but the speed and invincibility boosts can be held and unleashed at any time. This means that even when you manage to outplay the AI, they can randomly bust out a free invincibility item or speed boost and kill you with no effort. That being said, I don’t want to give the impression that this game is difficult or challenging, because it’s not. I easily won Mission Mode on my first try. It’s not tough, it’s just frustrating and aggravating to play. Once you’ve completed the three levels of Mission mode (well, technically six, but they just repeat the first three mission types again), you can move on to Mini Soccer mode. Here, you and a teammate simply push around a soccer ball and try to get it into the opposing team’s goal (well, it’s not so much a “goal” as it is a rectangular box that will give you a point if the ball touches it at all). Playing soccer as a caterpillar that can’t stop moving and dies if it touches another player is about as fun as it sounds, and the chances of anyone trying this more than once are slim. Lastly, there’s Obstacle Course, a straightforward mode where you attempt to get from one end of the stage before your opponent does. Like Mission mode, this task is painfully easy – it’s just annoying as heck thanks to the many walls littered about the level, which will slow your already sluggish caterpillar down to a crawl if you so much as graze them. Perhaps the only saving grace of Caterpillar Royale is that all of this can be done with up to four players, but why would you want to? You still have to deal with terrible cheating AI. You still have to suffer through annoying mechanics designed to irritate rather than inspire joy. You still have to look at the unappealing graphics and listen to the generic, repetitive music. People joke that Mario Party ends friendships due to the heated competition that ensues, but Caterpillar Royale will end friendships simply because your friends will be irrevocably offended that you actually thought playing this might make for a decent afternoon. All Starsign had to do to make Caterpillar Royale an enjoyable experience was rip off the tried and true formula of slither.io, but unfortunately none of the changes that have been made to the game are for the better. Save your cash and stick to the free browser version.